Although diamonds are still the most popular choice for an engagement ring, many couples are choosing alternative gemstones for their uniqueness and affordability. If you are on the search for the perfect ring and would like to find something that is one-of-a-kind, you might want to look into a unique type of gem instead of the usual diamond. Here are 10 diamond-alternative gemstones that we think make beautiful engagement rings. Sapphire engagement rings soared in popularity when Princess Diana received hers from Prince Charles in 1981. Sapphires are not only gorgeous with their deep blue hues but are also a 9 on the Mohs hardness scale and make very durable rings. There is really no stone like the opal. With it’s foggy and flashy appearance, it shows off a mysterious splendor when placed on a ring. Peridot is a beautiful olive colored gem found in meteorites or volcanoes. It has a 6.5-7 hardness score and makes a beautiful and defining engagement ring. In ancient times, the amethyst was thought to bring out the highest aspirations in a person and would protect its wearer from all sorts of worldly trouble. With a 7 on the Mohs hardness scale, the amethyst makes another beautiful yet durable gemstone option for an engagement ring. Demantoid garnets are rare, but make absolutely stunning engagement rings if you can find one. The word “demantoid” means diamond-like because of its similar brilliance. Aquamarine gets its name from its transparent seawater appearance. 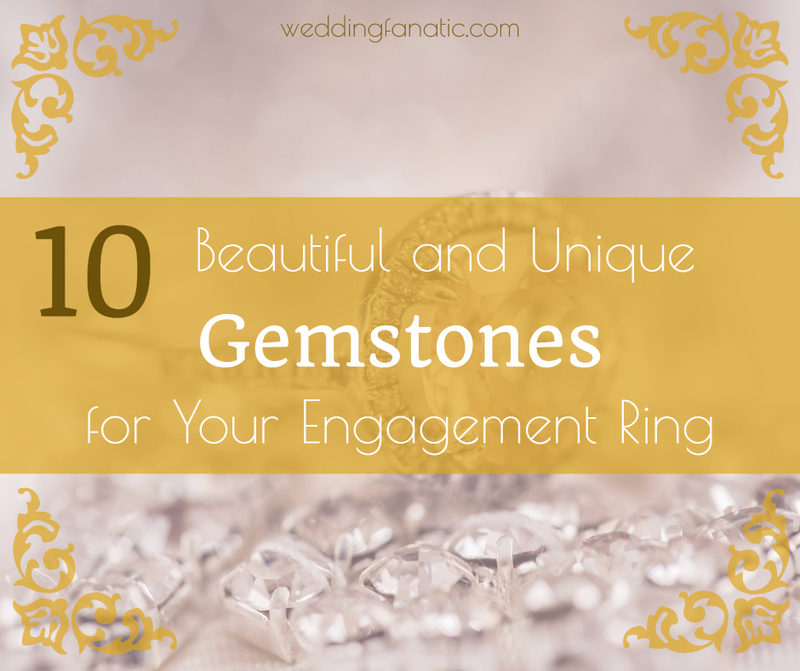 This gemstone is thought to bring happiness to marriages and is another captivating option for an engagement ring. An emerald’s hardness factor of 7.5-8 combined with their rarity makes them a very precious gemstone. If you can get your hands on an emerald, you will have a very stunning ring indeed. Topaz is known for its brilliance and the fact that it comes in a variety of colors. It is an 8 on the Mohs hardness scale and looks smashing on a ring. The soft look of pearl gives a beautiful and classy look to an engagement ring. Whether you pair it with another stone or simply leave it as a single centerpiece, a pearl might be the perfect choice for your ring. The ruby, or the “king of gems”, is a popular and alluring gemstone used in high-end jewelry. Natural ruby rings make a very elegant option for an engagement ring. If you would like to look into diamond alternative engagement rings, EraGem has a great selection of unique and beautiful vintage rings with many different gemstone options.